A vital stretch of Nassau County roadway along Oyster Bay harbor, damaged by Sandy, won't reopen for nine months, according to a county spokesman. Parts of West Shore Road in Bayville were buckled by the storm surge and the 2-mile stretch of road has been blocked to traffic ever since. "It's unacceptable. Nine months is a very long time for an emergency situation," said Bayville homeowner Margaret Marchand. Other residents joined Marchand Monday in demanding that the road work be completed sooner. West Shore Road is the most direct route to Bayville and Centre Island from neighboring inland communities. Until the road is reopened, drivers will continue using a 7-mile-long detour to get in and out of those waterfront neighborhoods. "In Japan, there was a huge section of highway that was reopened in a week after the earthquake," said Bayville resident John Taylor. "Where there's a will, there's a way." According to a Nassau County spokesman, the road work critics have it all wrong. Repair work on areas damaged by Sandy will be combined with a scheduled, long term overhaul of West Shore Road, said county Department of Public Works spokesman Michael Martino. What was supposed to be an 18-month-long project will now be completed in nine months, he explained. "West Shore road will be open to those who live on the road as well as emergency vehicles," Martino said. The detour will be used by all other drivers. "It is what it is," said Bayville's mayor, Douglas Watson. "The road got closed by Sandy, so we have no choice." According to Watson, speeding up the road project is a positive for the community. 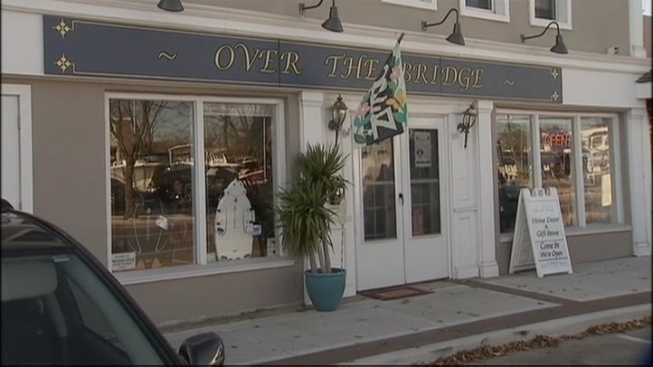 But, as she unwrapped items in her home and garden shop, Bayville store owner Gerianne Reilly wondered if the road closure would hurt local businesses. "People are going to think twice about driving an extra half hour into Bayville. So it is a concern," said Reilly. Her store was closed for three weeks after Sandy.